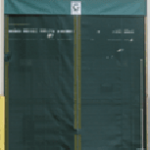 High-speed roll-up doors are specifically designed to be used in applications requiring fast-moving or high-volume traffic in a climate controlled environment. There are several high-performance roll-up doors to select from. Each door is custom built to meet your specific requirements. 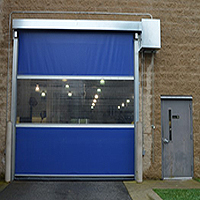 Having a fast cycle door is key to minimizing temperature loss or climate control while moving product in and out of a specific area. 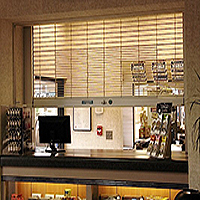 High-speed roll-up doors are available with many add-on options. 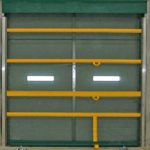 Fast acting doors can also work in conjunction with an existing steel roll up door. High-performance doors can range in sizes from 5’ to 50’ (Width and height). 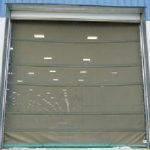 All industrial roll-up vinyl doors are sold as a kit with all parts necessary for a complete install. 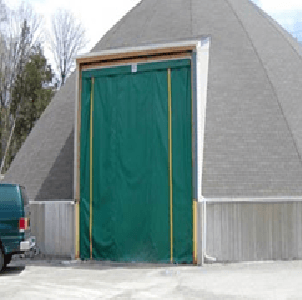 Larger doors will require lifting equipment such as a man-lifts or forklift. Electrical hookup voltage required can range from 120V single phase to 600 V three-phase. Because each door is custom made, providing the proper finished opening sizes is important when placing your order. All doors require an approved shop drawing before manufacturing begins. Depending on the door model, high speed doors or high performance doors can travel as fast as 55-80 inches per second. This ensures minimal temperature loss when moving cargo from one room to another. Accidental door contact is more prevalent with fast-moving motorized traffic. For this reason most of the doors have a built-in breakaway bottom bar feature (also known as breakaway doors). If the door becomes dislodged from the track from contact with motorized equipment, it can be easily reset to the home position after the door has been fully retracted. All doors are packaged for assembled as a complete kit. This will minimize installation time and labor cost. All high-speed doors come with a three position wall switch. Optional openers include motion sensors which can be set to operate with approaching cart and/or motorized traffic. A pull switch, typically hangs 3 to 5 feet from the door allowing fork truck operators to open the door while seated on their equipment. The magnetic pickup wire is groove cut into the concrete. This will open only after a metal cart or fork truck has passed over it. Remote control operators can be stationed on motorized equipment or carried by hand. Keypad operators are usually used in conjunction with restricted areas.